The food pyramid is a model used to describe a diet and is currently designated as the basis for some foot regime. It can be seen as a set of rules to follow to feel better, not necessarily as a purely weight-loss pattern. The food pyramid model use, as it says, a pyramid to indicate which food and in what proportion should be eaten ​​during the week. It is possible to use the food pyramid to describe a range of nutritional rules which does not necessarily imply a quantitative indication (portions, calories, percentages of macronutrients) but more often are only qualitative (i.e. which foods privilege against others). There are many food pyramids proposed in the literature, such as the pyramid of Mediterranean and Asian, to name two of the most famous. One of the best pyramid food ever is the italian one, in which is used a two-dimensional array of foods in spite of the classical three-dimensionality. 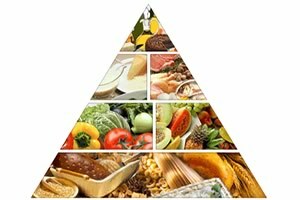 The advantage of that refers to an easier use of the pyramid to better understand what is preferable to eat. In the pyramid, foods are stacked and since the base is larger than the tip, foods inserted first are those favoured in the diet, so they can be taken in larger quantities. As you move up along the food pyramid, quantity decreases and, in parallel, also decreases the importance of that food in the diet itself. Foods at the top are the ones that you should consume more sparingly, because they are judged to be less important to the maintenance of an optimal weight or at least the preservation of a good state of health.